We will release 0.4.1.45 patch soon. It is mainly the compatible script changes from the as yet unreleased new binary version. See the list here. Players have picked a time for weekly matches, Sunday Night 11pm UTC - read the calendar event here or read the forum topic. You can also subscribe to the calendar events using various programs like Outlook or Thunderbird or your fancy phone. Sorry, we moved the server and a few things broke, the previous server was getting old. The Master Server is now being hosted on a separate server and we will add a direct IP as secondary server in case this happens again. Loss of service in this day and age.. sheesh. 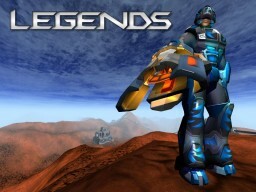 Legends is now supported by Xfire InGame (a Windows app that lets you see where your friends are playing and logs your time spent playing supported games). Xfire also makes those forum sig images which have your game stats in them.